The Aegean cost of Turkey has a special place in my heart. Perhaps it is the many happy childhood holidays we spent in local resorts in Ayvalik, Gumuldur and Cesme, where many Turkish families have summer houses. As soon as the schools close, we all would dream about the coast, swimming at the turquoise Aegean, playing for hours at the golden sandy beaches and the next ice cream – a piece of heaven. I don’t have the chance to go back to the Aegean as often as I like and every opportunity is very welcome. 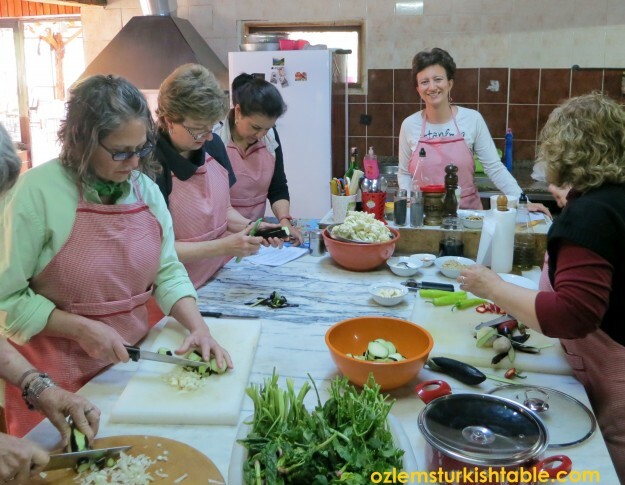 Once a year, I host and organise a Culinary & Cultural tour to Turkey, aiming to show my homeland from a local’s perspective – I greatly look forward to these trips and enjoy every minute of sharing this special land with folks. 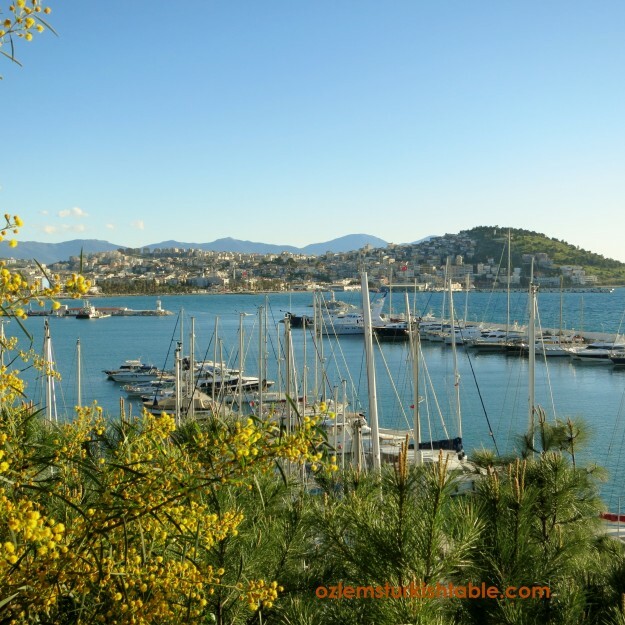 It has been delightful to be back to the breathtaking Aegean region again this April. 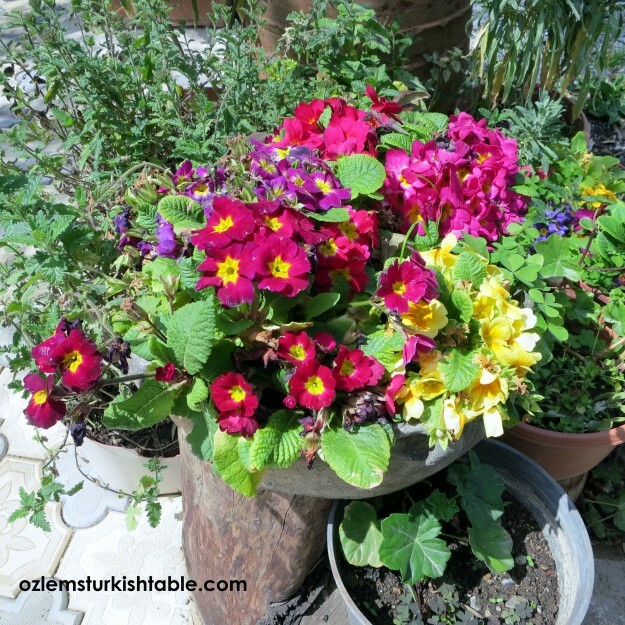 Spring has been in full bloom; artichoke fields everywhere; the silver, beautiful olive trees welcomes you along the way; fig trees surprise you at the Ephesus – such a beautiful, bountiful region. During our tour, we always enjoy the local cuisine and learn how to cook delicious Turkish food together. 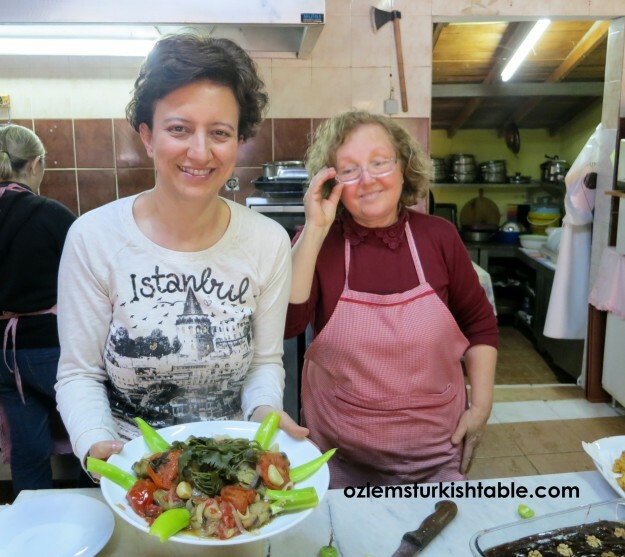 This time, we again stopped by the lovely Bizimev Hanimeli to cook and enjoy delicious Aegean flavors with Hatice Hanim. 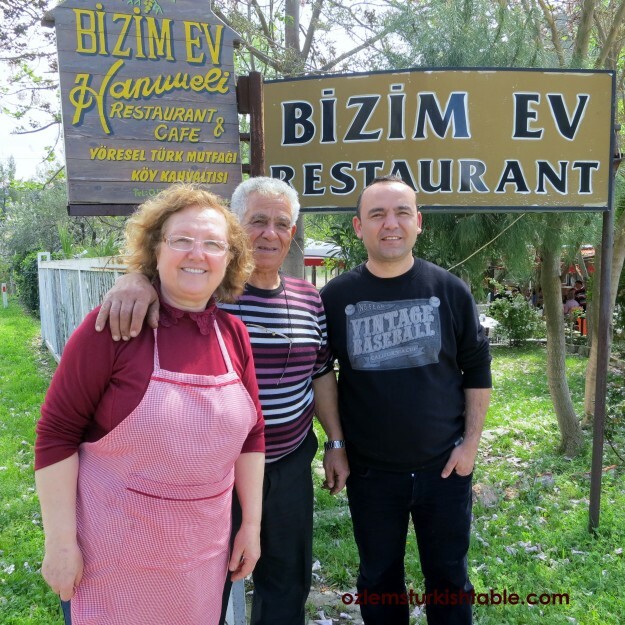 I have met Hatice Hanim a few years ago; always with a smile at her face, she has been sharing her love of Turkish cuisine and feeding a remarkable crowd everyday at their Bizimev Hanimeli Restaurant, as well as teaching the local cuisine to enthusiasts like us. It is a real family affair; her husband, son, daughter, daughter-in-law all involved running this wonderful business. 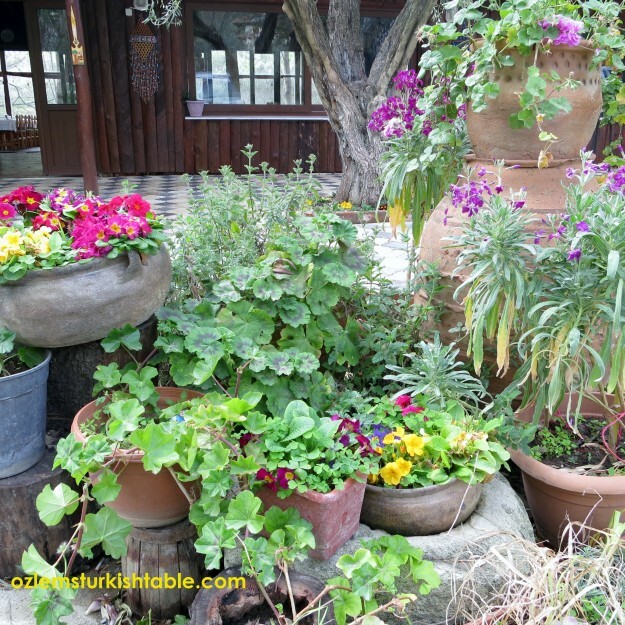 I love the fact that they grow all their fresh produce, herbs, vegetables and fruits in their beautiful garden and make their own olive oil. It is very remarkable that they grew their business all by themselves with a lot of hard work and maintained the same friendly service and the offer of high quality, consistent, delicious food. When I asked Hatice Hanim what kept her going in tough times, she smiled and said; “If you respect your land, the nature, treat your helpers, family well and keep your spirits up, you find a way at the end. Hard work with a kind heart opens the doors for you; always believe in yourself.” How true; her words sealed in my mind. We prepared a delicous 4 course meal with Hatice Hanim, in just over 1 hour – look forward to sharing all these recipes in the coming weeks- .Using their fresh produce from the garden and the olive oil, we made this wonderful Zeytinyagli Patlican; Eggplants, onions, garlic and tomatoes cooked in olive oil; simple, seasonal ingredients produced such a delicious, memorable taste. 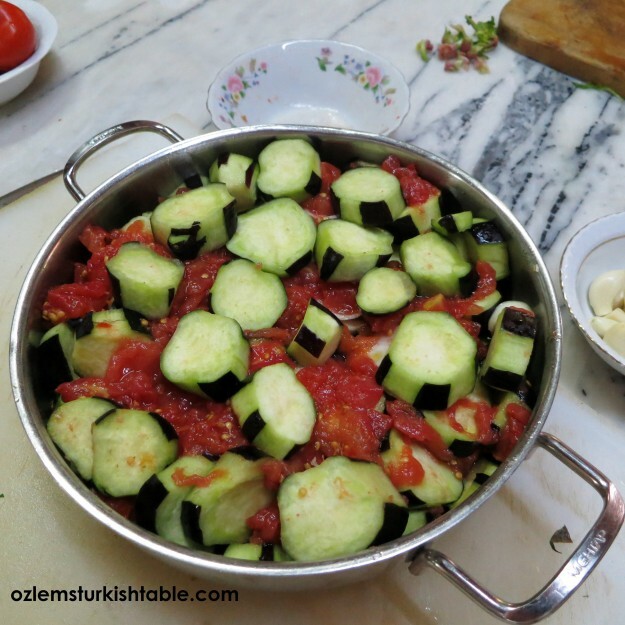 We like to eat Zeytinyaglis, Vegetables Cooked in Olive Oil in room temperature. It is also delicious when served cold. I hope you enjoy it and can have a go sometime. Using a vegetable peeler, peel the eggplants in zebra stripes. Cut each eggplant in half length wise and then about 1/2 inch thick slices. Lay them on a wide flat tray and generously season with salt. This will help the moisture to come out of the eggplants. Leave for about 15 minutes. Drain the water that came out of the eggplants and squeeze them with a paper towel to extract the excess water. Layer the sliced onions, garlic, pepper and eggplants one at a time. Pour the olive oil in a heavy pan and spread the half of the sliced onions and garlic. Then spread half of the sliced peppers and a layer of sliced eggplants over them. Repeat the same layering procedure for the 2nd half of onions, garlic, peppers and eggplants, and pour over the diced tomatoes. If you have any remaining eggplant slices left, layer them over the top. 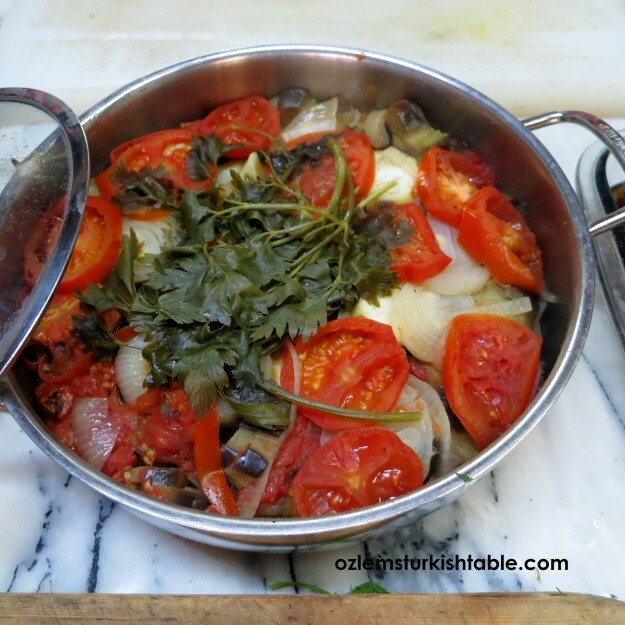 Add the sliced tomatoes and a handful of parsley over the top. Spread the sliced tomatoes over the very top and place a handful of flat leaf parsley. Season with salt and ground pepper and cover the pan. Start cooking at a medium heat for the first 5-8 minutes, then turn to heat to low and cook for a further 3o minutes, until all the vegetables are cooked. Delighted with the outcome :)! The vegetables here has been cooked in their own juices over low heat, and each of them just melt in your mouth! The cooked eggplants, garlic onions so scrumptious, packed with flavor. Seasonal produce cooked this way are not only healthy, but also very easy and delicious too. I hope you enjoy this delicious eggplant dish, as you see, delicious food can also be healthy and easy. A few good seasonal produce, some olive oil and fresh herbs can produce wonders. You can drizzle a little extra virgin olive oil over the dish before serving and decorate with sliced peppers if you like. Traditionally, we like to eat Zeytinyaglis, Vegetables Cooked in Olive Oil, in room temperature or cold. It is very rewarding to cook together and share a delicious bite with others. 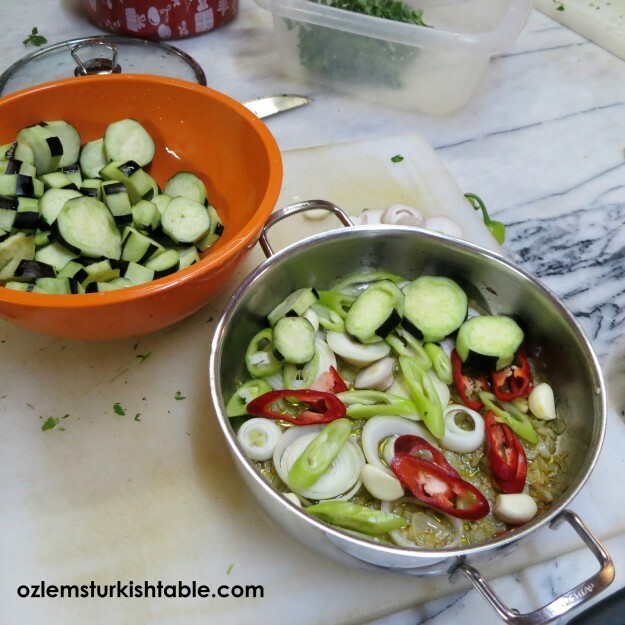 We have a fabulous healthy eating event with my Turkish cookery demonstration on May18th; if you are in the area and would like to join us, please contact me, I would be delighted to have your company. 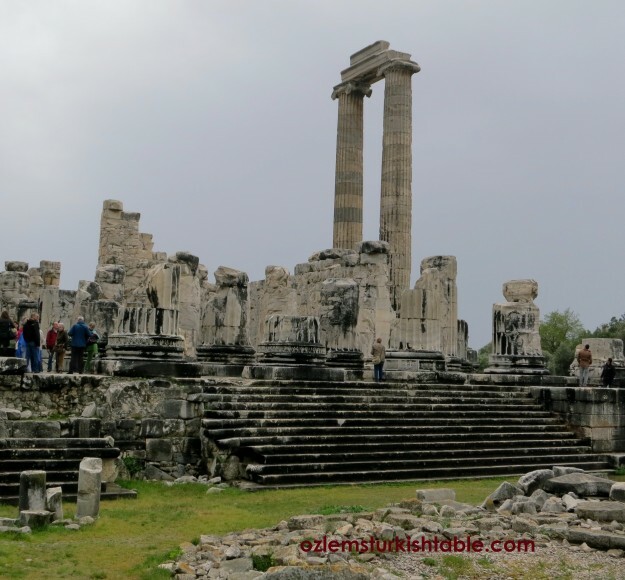 We made it to the fascinating Didyma, at the Aegean region, Turkey, at a rainy, windy April day and the temple looked even more stunning and dramatic. The huge white-marble temple is simply amazing and so worth seeing. The gigantic Temple of Apollo at Didyma (Didim in Turkish) was among the most famous oracles in the ancient world, equal in importance to the oracular temple at Delphi in Greece. There has been a temple here since very early times, but the older structure was destroyed by Cyrus of Persia in 494 BC. Construction began on the present stupendous structure soon after. 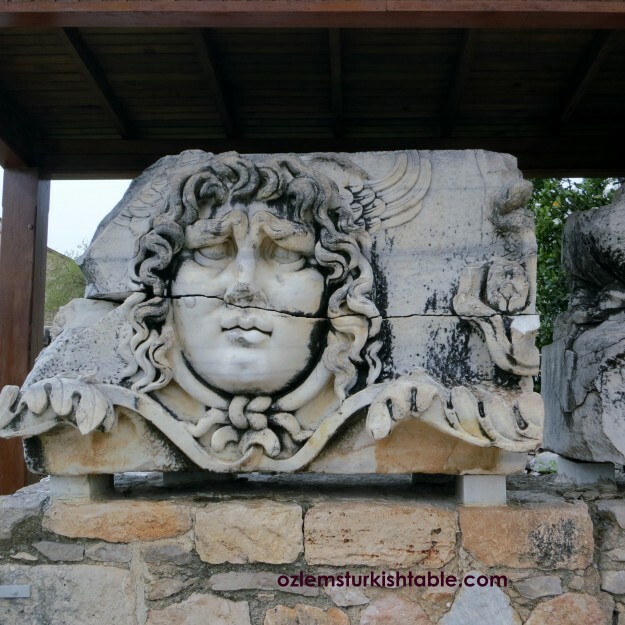 Head of Medusa at Didyma – we have been comparing it with the Medusa at the Basilica Cistern, Istanbul. But most of all it was the delicate, exquisite columns of Didyma, that fascinated me. Originally, 122 enormous Ionic columns surrounded the temple; today only three remain intact. Dating from the 2nd century BC, the columns are 60 feet tall (the height of a six-story building) and have a diameter of 6 feet at the base. Even the stumps of columns that fell are impressive in size and display beautiful carvings at their base, like designs of Daphne leaves. 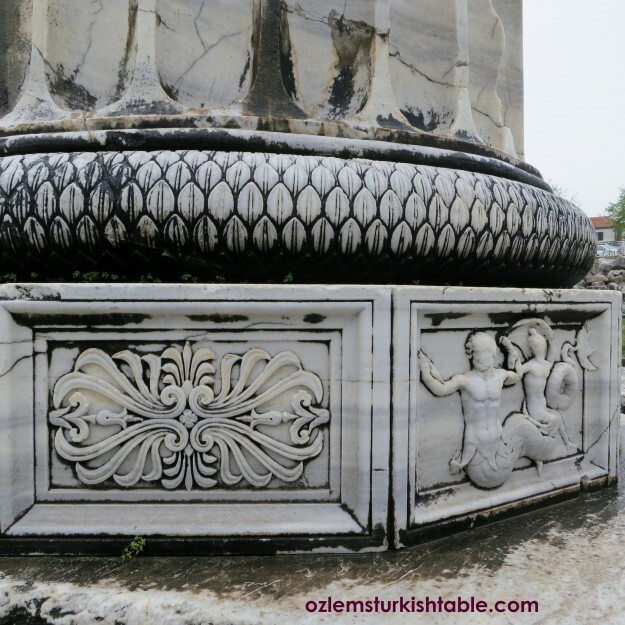 It’s all in the details – beautiful carvings at the marbel columns of Didyma. Make sure to have enough time to walk all the way around the temple to get the full effect. Didyma is well worth visiting, hope you can make it here sometime. 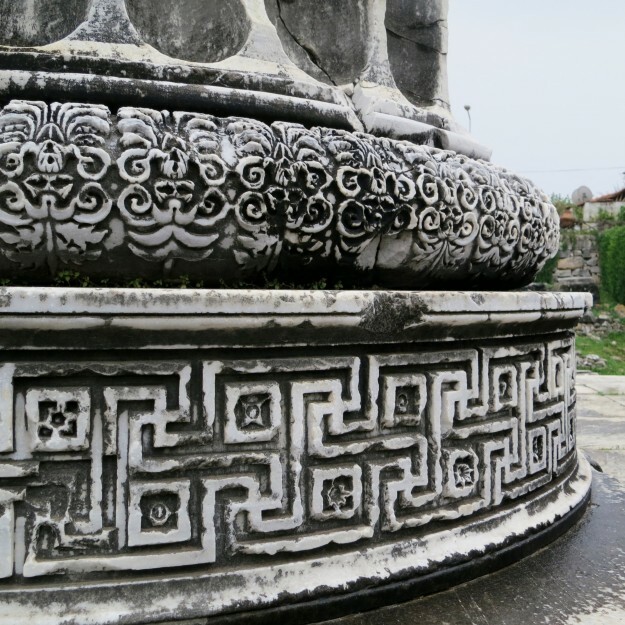 One of the things I love about Istanbul, is the exposure of thousands of years of history. 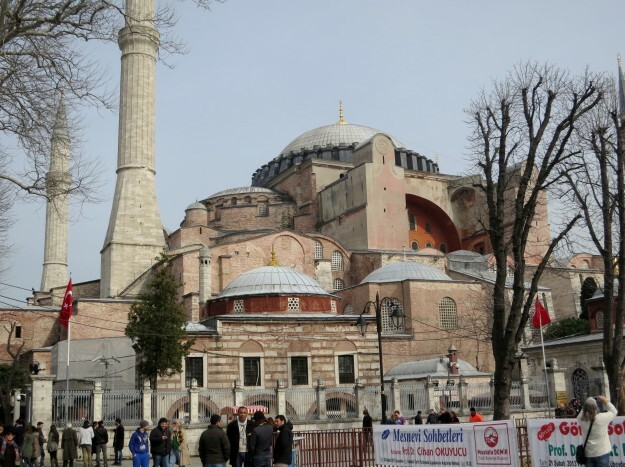 Indeed, Istanbul is a city where east meets west; at one side the ultra modern buildings, the other side, the centuries old Old Istanbul with Hagia Sophia, the Basilica Cistern and many more. The east and west surprisingly blend in well, and you feel you are walking around an open air museum, so breathtaking. Sultanahmet in Old Istanbul has such amazing sites like the Topkapi Palace, the Blue Mosque, The Basilica Cistern and many more, all these wonderful pieces of history are within walking distance to one another. The area is also very child friendly; wonderful to see lots of children visiting the museums, feeding their curious minds. I took my 9 year old son to Sultanahmet in Old Istanbul; we took the underground (subway or Metro, as locals call it) from the European side of the city, Levent, all the way to Taksim and then to Karakoy, so efficient. Then we took the Tram from Karakoy to Sultanahmet; worked so well, and no hassle of traffic (and must say, even the journey itself was exciting for my son!). My son is fascinated with the 6th century cathedral size Basilica Cistern, especially with the Medusa column. 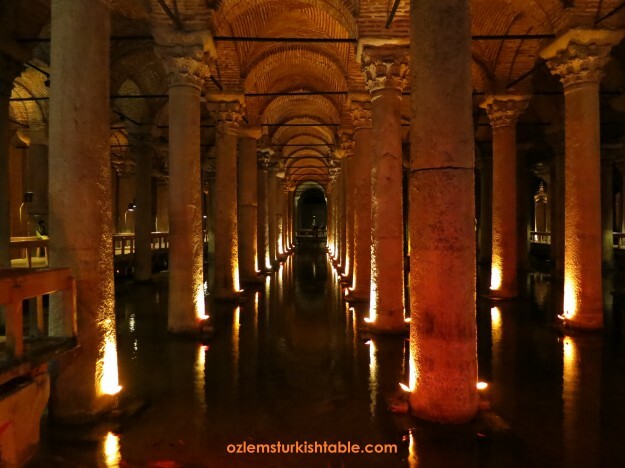 The Cistern is the largest of several hundred ancient cisterns that lie beneath Istanbul. I love the tranquility in there; you feel like you paused the time for a while, so peaceful. 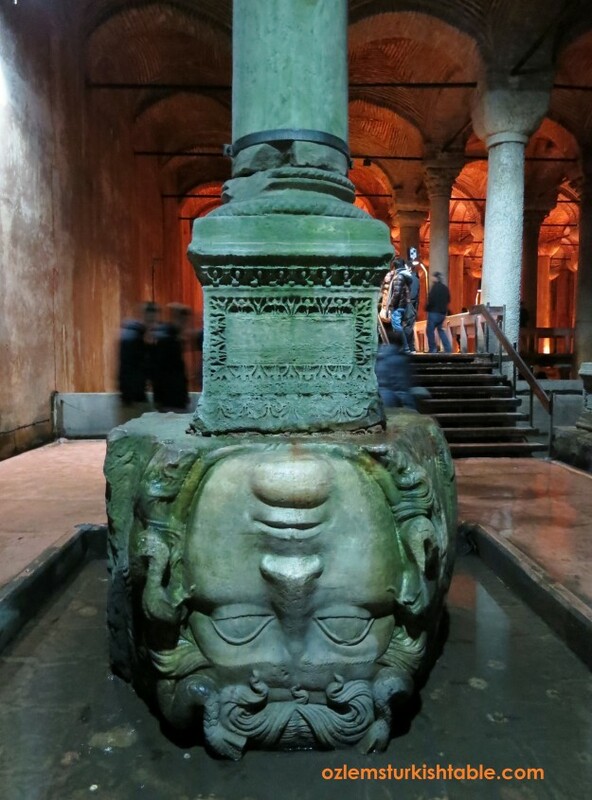 Upside down Medusa pillar, Basilica Cistern, Istanbul. The Medusa pillar was a highlight for my son, as he studied the Roman period this year and read about the Medusa. He was eagerly telling me all about the snake hair and many legends behind it! Soon, we were hungry (there’s always time for food at home!). 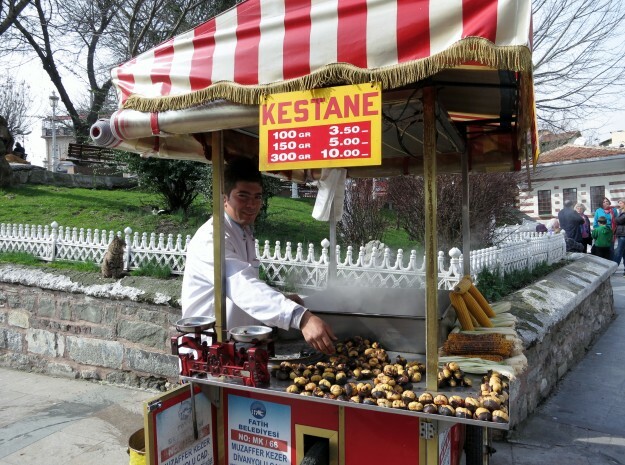 Street food, stalls selling Simit, sesame-encrusted bread rings, roasted chestnuts and corn are every where in Istanbul. They are great value and just hits the spot when you are out and about. We had our fair share of roasted chestnuts right outside of the Basilica Cistern, delicious. Hafiz Mustafa in Sultanahmet carries a wide variety of Turkish delights, and has a wonderful cafe. 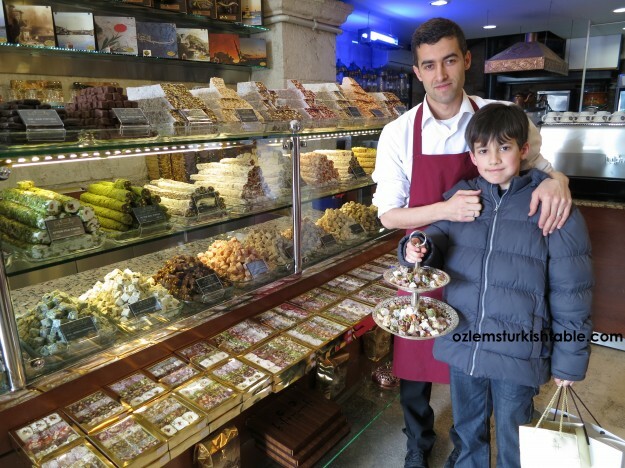 Well, we couldn’t just had the chestnuts, as my son spotted his favorite sweet, Lokum – Turkish Delights! Hafiz Mustafa has been producing Turkish Delights since 1864 and this shop is a wonderful experience. The friendly staff showered my son with complementary Turkish delights, and the Literary Cafe inside the shop looked very inviting. Home made Turkish delights are surprisingly easier than you think and delicious, here is my recipe for Turkish delights, if you like to have a go. 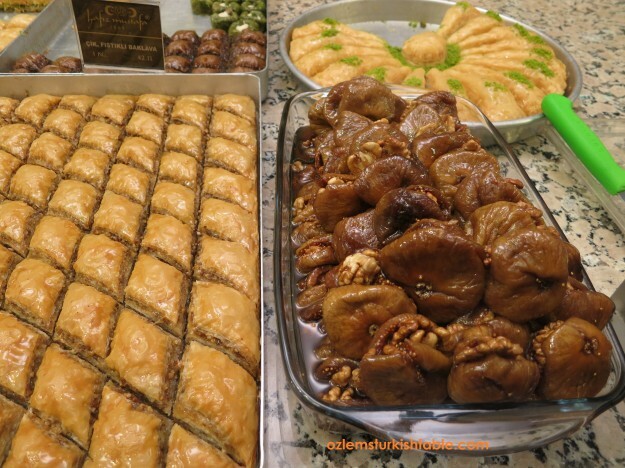 Baklava, dried figs stuffed with walnuts – all so very inviting. As expected, we had our fair share of the baklava. The dried figs here have been cut in half and stuffed with walnuts; they are then poached in syrup and cooked until soft, so very delicious. Figs and walnuts are also power food, very nutritious, and packed with antioksidants. My parents and my dear sister Oznur live in Istanbul and they are my eyes and ears. They kindly fill me in what’s the latest in the city, especially at the food front. As our roots go back to Antakya, ancient Antioch, they keep a close eye on especially the Southern Turkish food available in Istanbul. 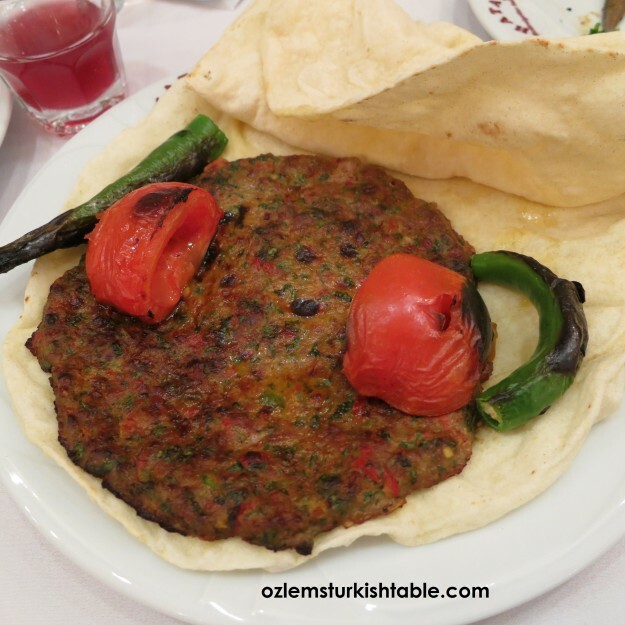 When my dad said that we have to try the newly opened Hatay Medeniyetler Sofrasi Restaurant in Taksim, the plan was made and my sister and my cousin Duygu made it there the next day. Antakya has been a city of tolerance; Christians, Muslims and jews live happily and in peace there. This picture show the St Peter’s Chuch and the Habib-i Neccar Mosque in Antakya. Antakya, ancient city of Antioch has been occupied by humans since the Calcolithic era (6th millennium BC), and hosted many civilizations ; the restaurant makes its name as of the Table of these Ancient Civilizations. Antakya has historical significance for Christianity as it was the place where the followers of Jesus Christ were called Christians for the first time. Antakya since then has been a city of tolerance; Christians, Muslims and Jews live happily and in peace together in Antakya. 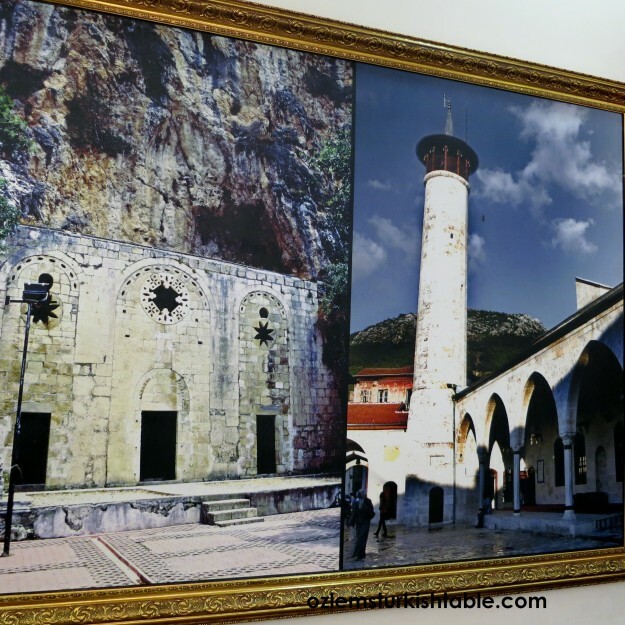 This picture at the restaurant show the St Peter’s Chuch and the Habib-i Neccar Mosque in Antakya. Ismail Bey from Hatay Medeniyetler Sofrasi; so passionate about the history and cuisine of Antakya. We greatly admired the passion of Ismail Bey from Hatay Medeniyetler Sofrasi for Antakya’s history and cuisine. The whole restaurant is full of pictures from Antakya; the Mozaic Museum, St Peter’s Church, the famous Long Market – Uzun Carsi and many more. Ibrahim Bey says they source 90 % of their ingredients from Antakya and proud to serve regional Antakya dishes in the restaurant. 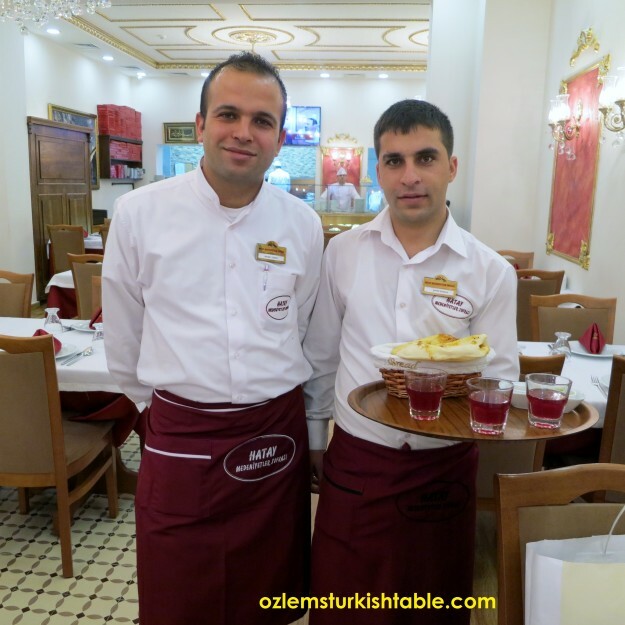 Another great thing about Istanbul; you can now taste a variety of regional cuisines, the city is such a melting pot. A huge tray of delicious mezzes of Antakya greeted us; Cevizli Biber (Walnuts with red pepper paste and olive oil), hummus, zathar salad, Zeytin ufeleme (olive salad with pomegranate molasses) and many more. Smoked eggplant with vegetables, olive oil, dried mint & lemon dressing; delicious and refreshing. 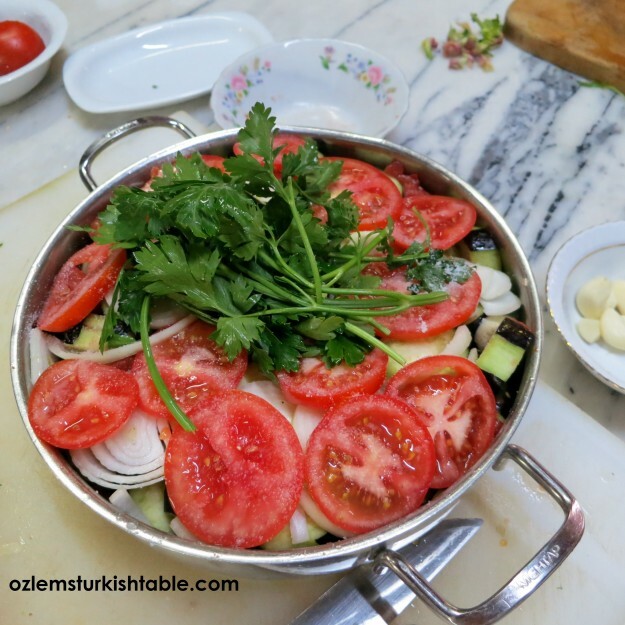 One of the mezzes that we enjoyed is Patlicanli Eksileme – Smoked Eggplant Salad with tomatoes, onions, parsley with olive oil, dried mint & lemon dressing. The sweet, smoky flavor of the eggplants here work so well with the vegetables and the dressing, here is the recipe if you’d like to try out. Then came Abagannuc; sauteed chunks of lamb served over Abagannuc; the smoked eggplant, tomato and pepper sauce, just melted in the mouth. Feast continued; this is Antakya’s Kagit Kebabi; Kebab baked in the oven in a special baking paper. I have vivid childhood memories of taking the ground meat mixture to my grandmother’s local bakery in Antakya, to cook this kebab for us (bakerys in Antakya also bakes many kebabs, casseroles and pastries for their customers). Ground meat, garlic, parsley, onion and spices in the mixture, another local specialty. 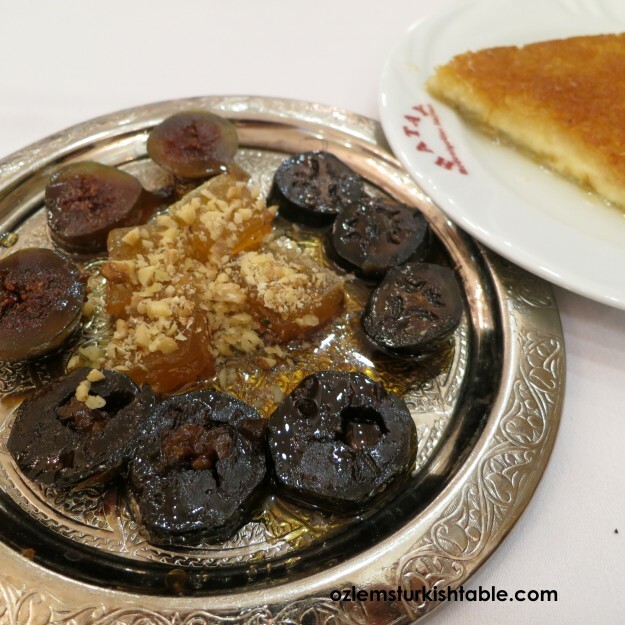 Candied walnuts, figs and pumkin – and of course Kunefe! Now time for the sweets; this time came the wonderful candied walnuts, pumpkin and figs, along with Antakya’s famous kunefe. The candied walnuts are a real speciality of Antakya, along with others; locals start making this dessert at the early months of summer, and its preparation can take up to a month. Young walnuts are soaked in water for a long period so that their bitterness goes away. Once they are cooked, the walnuts again soaked in syrup for a long time, a real labor of love. 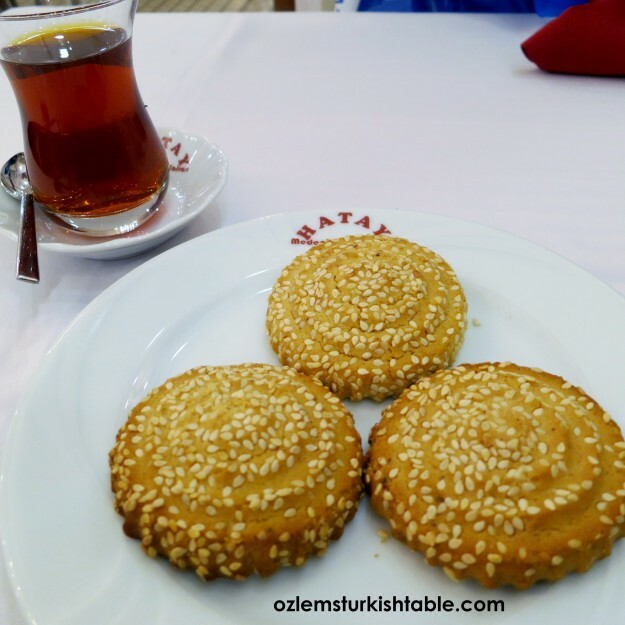 Antakya’s Kombe cookies; a great crumbly texture, with flavors of tahini, sesame seeds, cinnamon, wild oregano and more. Ismail Bey kindly treated us to Antakya’s famous Kombe cookies, another regional specialty. It has a wonderful, crumbly texture and delicious flavors of tahini, sesame seeds, cinnamon, wild oregano and more. They were so good that I had to save one to take to my parents! Menengic Kahvesi, another Southern Turkish specialty. Have you ever tried Menegic coffee? 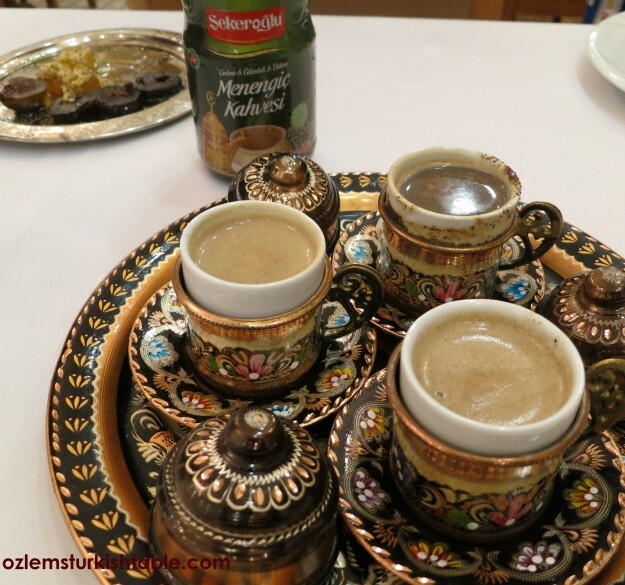 It was my first time trying this aromatic, delicious coffee, another Southern Turkish Speciality. 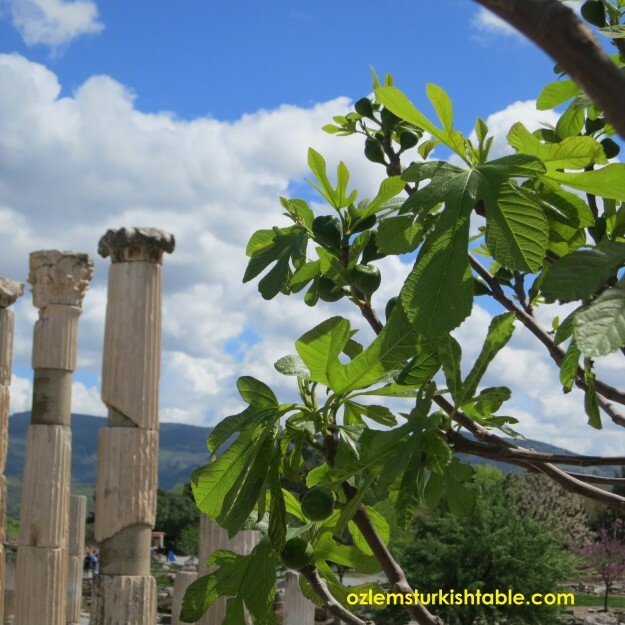 Menengic, or cetene or citlenbik, as locals call it, is Pistacia terebinthus, known commonly as terebinth and turpentine tree, is a species of Pistacia, and wildly grown in Southern Turkey, part of the national flora. Cooked with milk, you can certainly get the wonderful pistachio taste, a unique experience. Locals in Southeastern Turkey also liberally incorporate menengic’s oil into home-made sweets (baklava, kadayif, halwa, cookies and more) as it counters sugar and gives an unworldly delicious taste. In addition, menengic’s oil is regarded very healthy and packed with goodness. 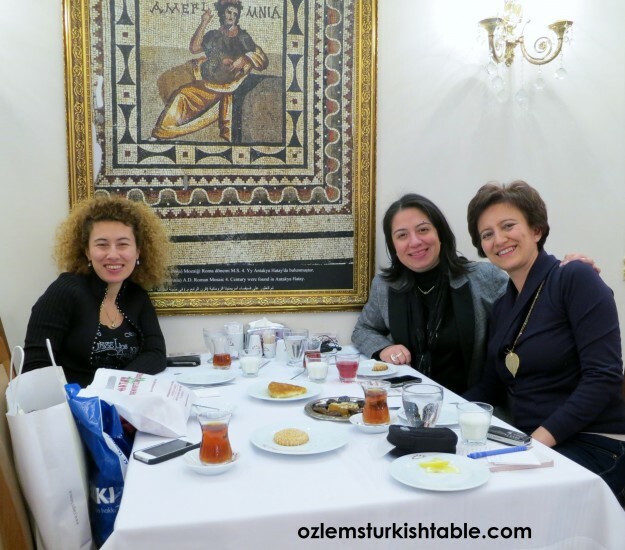 We enjoyed a truly delightful feast, treasures of Antakya, with my sister and cousin in Taksim, Istanbul – so worth a visit. 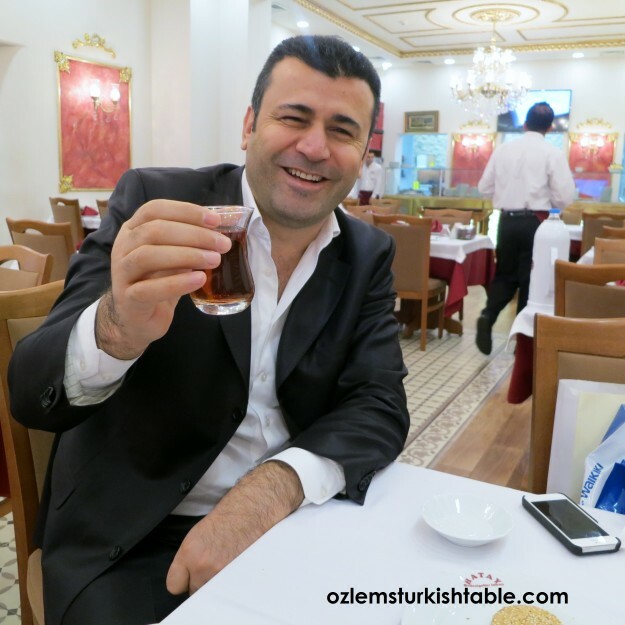 I hope you enjoyed our adventure in the fascinating city of Istanbul and a taste of Antakya available in Istanbul. As you can see, many of the mezzes and dishes here are so easy to make, healthy and delicious, I hope they inspire you to have a go. 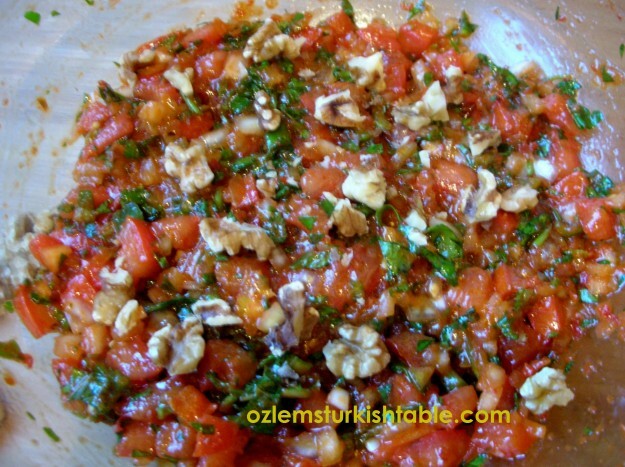 Scrumptious spread of Ezme; makes a great appetizer and goes really well with grilled meat and vegetables. 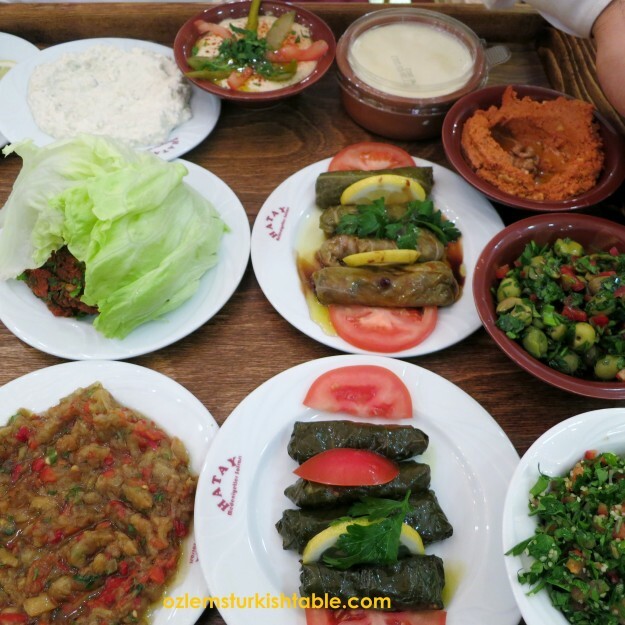 Have you ever tried the delicious Turkish mezze, Ezme? 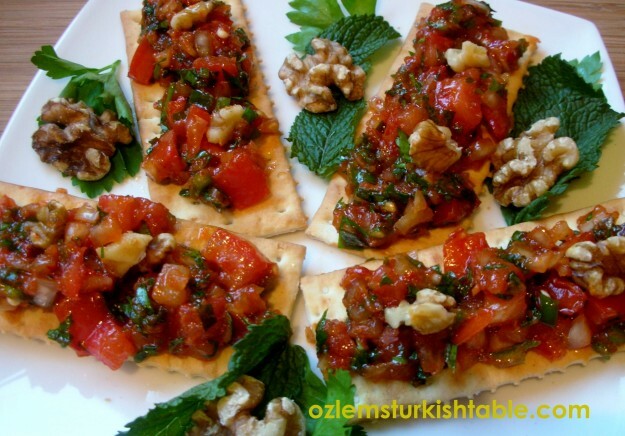 This tomato based delicious appetizer has a wonderful mixture of sweet, spicy and acidic flavors and it is one of my favorite mezzes served in the kebab houses at home, a very memorable gastronomic experience. Humble and fresh ingredients like tomatoes, onion, peppers transform to a magical taste with a touch of red pepper paste and extra virgin olive oil. 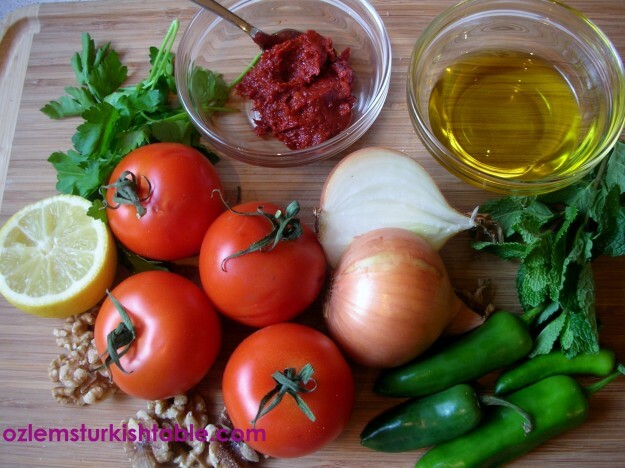 Ezme is a very typical Turkish mezze, served in kebab houses throughout Turkey. With a touch of hot red pepper paste and extra virgin olive oil, these simple but fresh ingredients like tomatoes, onion, herbs and good olive oil produce this surprisingly complex yet refreshing and a very more-ish mezze. You can make Ezme ahead of time, so it is very entertaining friendly too. Biber Salcasi; Turkish hot red pepper paste add a lot of flavour to dishes; you can also easily make at home too. 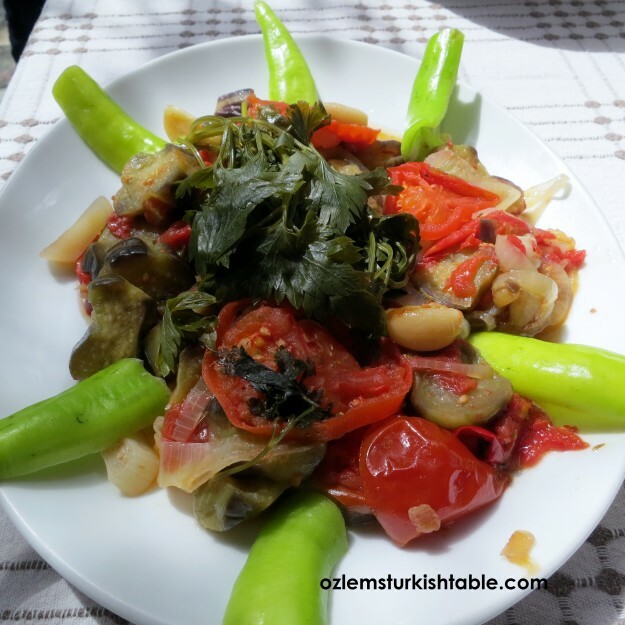 There are quite a few variations for Ezme; my favorite is the way it is done in the Southeast Turkey, where my roots are from. 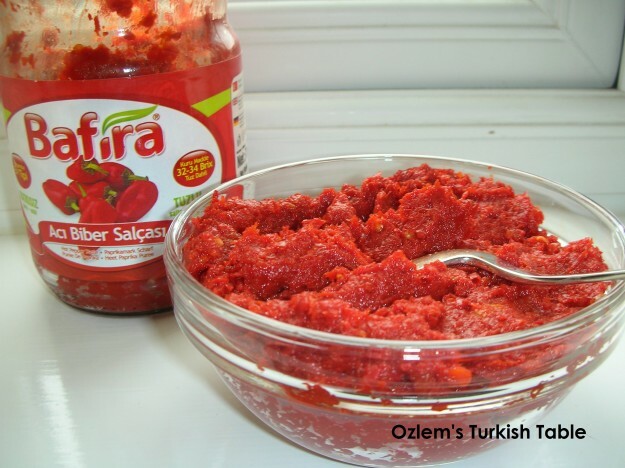 Biber Salcasi, Turkish red pepper paste is a major staple in the regions of Gaziantep and Antakya and a little of this wonderful paste adds such a rich, complex flavor to the Ezme. You can also make red pepper paste at home with my recipe, easy and delicious. An important trick to Ezme is to rub the red pepper paste and tomato paste to the onions with your hands so that the paste infuses; these also soften the onions and make them more palatable. You can serve Ezme over crackers or pita bread as an appetizer; it can also accompany kebabs, grilled meats and roasted vegetables beautifully too. 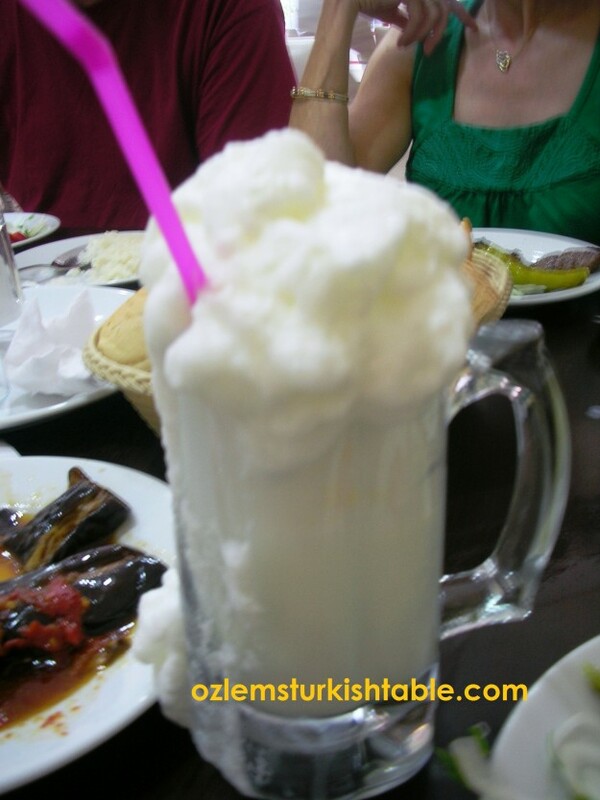 Why not try Ayran, delicious Turkish traditional yoghurt drink to accompany this wonderful feast? 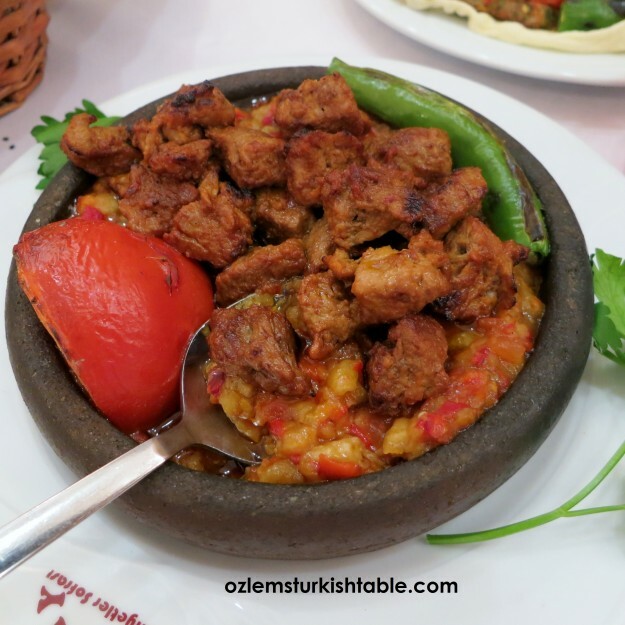 Turkish cuisine has a long and rich tradition of incorporating hot and cold mezes, regional, delicious dips and salads, variety of vegetarian, vegan and gluten free courses. 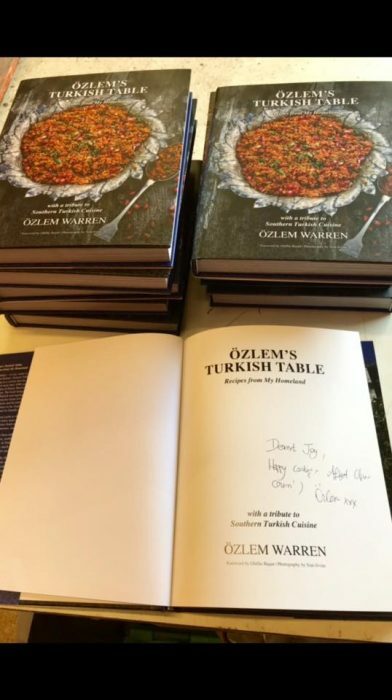 They have all been included at my cookery book, Ozlem’s Turkish Table; signed copies of my cookery book is available at this link. 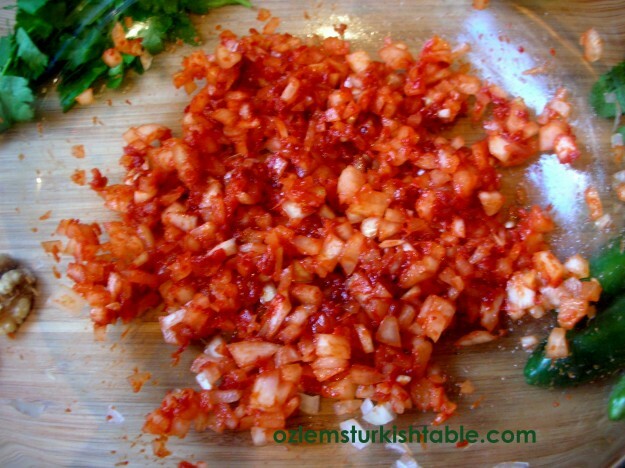 Combine the red pepper paste and tomato paste with the onions in a bowl. Knead and mix them well with your hands so that the paste infuses to the onions; this also softens the onions and make them more palatable. If you can’t get red pepper paste, you can add a touch of spice with 1-2 tsp red pepper flakes and infuse them to the onions with the tomato paste. Ezme is ready to be enjoyed; though not traditional, I like to add a few walnuts over Ezme when serving, for extra texture and taste. Stir in the tomatoes, peppers, parsley and mint, combine well. Drizzle the extra virgin olive oil over. Season with salt and ground pepper and give them all a good mix. Cover and keep in the fridge until serving. It would be best if you can let the Ezme sit for an hour or so before serving; this will help the flavors mingle & settle. You can prepare Ezme ahead of time; it tastes even better the next day! Ezme is delicious over flat bread, crackers, pitta bread. I like to add a few walnuts over when serving, love the added texture and taste it adds. Though not traditional, I like to sprinkle a few walnuts around Ezme when serving; I love the added texture and taste walnuts brings to Ezme.